The 765-10-30.000 from MECA is a 5G ready millimeter-wave coupler that operates from 26 to 34 GHz. 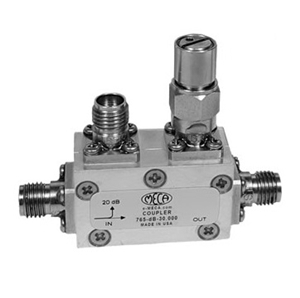 Available with a coupling value of 10 (20 dB also available), this coupler has an insertion loss of 1.2 dB and directivity of over 13 dB. It can handle an average power of up to 20 watts and has a VSWR of 1.6:1. The 765-10-30.000 is available in a module with 2.92mm female connectors.